Honda’s HRX mowers are top of their class, combining comfortable, accessible ergonomic design features with robust materials and powerful engine technology. You will be hard pressed to find any other selection of similar machines that can compete against these modern, high performing lawnmowers. The HRX537HY comes fitted with Honda’s hydrostatic propulsion system, which keeps the blade speed optimised for cutting, no matter the speed at which you choose to mow. Performance is guaranteed by the inclusion of a powerful Honda GCV OHC 187cc petrol engine, which not only offers consistent power but also works to reduce sound output. The cutter blade itself is also designed with sound reduction in mind, and should you accidentally hit a stone or other solid object he blade will bend instead of breaking, minimising any damage to the engine or cutting deck. The deck itself is constructed from polymers instead of metal; Honda’s Xenoy® polymer is corrosion resistant and lightweight, designed to be fully capable of withstanding the rigors involved in heavy mowing workloads. 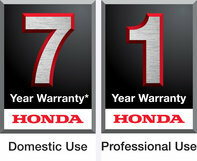 Honda even offer a seven year warranty (subject to servicing) to provide added peace of mind that you will be able to get the very best from this amazing lawnmower. Transporting this mower is also very safe and simple thanks to the inclusion of Honda’s easy to use RotoStop® blade brake clutch, which allows you to keep the engine running but stop the cutting blade, eliminating the need for engine restarts. Storage is made equally effortless due to this model’s easy to fold handlebars. Honda HRX lawnmowers are supported with the most comprehensive warranty in the industry: 7 years when used in a domestic environment. All Honda mowers sold by LawnmowersDirect receive a pre-delivery inspection, specifically required from all Honda Authorised Dealers. • Versamow variable mulching system, allowing the user to choose the degree to which they recycle or collect grass, or even do both! Perfect for mowing at a pace that suits you. For larger areas, slopes or demanding conditions Hydrostatic transmission allows a smooth, stepless speed adjustment. This reliable Hydrostatic technology is also used on our professional machines. Versamow ®offers you the opportunity to switch between mulching and collection modes effortlessly. What’s more, we designed MicroCut, a system that uses two blades so the grass is cut twice in order for the clippings to be as small as possible. Versatility at its finest. Roto-stop®is otherwise known in the industry as a Blade Brake Clutch. With this feature you can control the blades independently of the engine control. When the handle is released the blades will disengage but the engine will continue to run. Our mowers are built better to last longer. That’s why we can offer you a rock-solid warranty for domestic and professional use on our core range products, covering both parts and labour. The warranty also maintains the same value throughout the warranty period – meaning the last day of cover is exactly the same as the first.